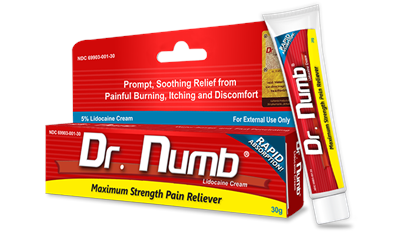 Dr. Numb® Topical Lidocaine Cream is specifically formulated to temporarily relieve pain and/or itching by depressing cutaneous sensory receptors. Keep in mind that the onset may begin 15 – 20 minutes after application and may take full effect within 30 – 60 minutes. It is manufactured in GMP-approved, state-of-the-art facilities and formulated according to strict regulatory guidelines.